Pool clubs have become ubiquitous in Las Vegas. Boasting dance-floor-packing DJs, state-of-the-art sound systems and islands adorned with stripper poles, they're the daytime versions of Sin City's famously profitable nightclubs, and these new-style operations are transforming money-losing swimming pools into profit centers. "Right now, the pool club is incorporated in the entire hotel product," says Joseph Magliarditi, CEO of the Hard Rock Hotel & Casino. After somebody makes a decision to go to the Hard Rock's pool club, he says, "they can also make a decision to eat at our steak house, Rare 120°, dance at our nightclub, Vanity, and gamble in our casino. Then maybe they decide to stay the night." And with admission fees in the $40 range, cabanas coming with food-and-drink minimums that run to thousands of dollars per afternoon, and bottles of Grey Goose vodka going for $400 apiece, there's clear motivation to increase the allure of pool clubs: direct profit. At the Hard Rock, a Sunday bacchanal known as Rehab attracts the hard-bodied, hard-partying set. Over at the Mirage, Bare makes a name for itself by encouraging women to doff their tops and sunbathe European-style. Steve Wynn's newly opened Encore Beach Club strives to bring a St. Tropez vibe to the Vegas Strip. And at HRH, the Hard Rock's recently launched luxury tower, management introduced SKYBAR, which scales down the swimming pool mega-club and reinvents it as an exclusive ultra-lounge, complete with a glass-walled pool and platters of sushi. "The conservative number, revenue wise, is that a pool can generate $1 million per week," says Magliarditi. "And that mostly happens over the course of a weekend. Right now, the challenge is to get people in for more days." 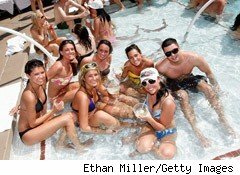 The enormous Encore Beach Club -- more than 60,000-square-feet and reportedly built at a cost of $70 million -- is attempting to answer that challenge by contracting marquee-name DJs such as Kaskade and outfitting bungalows with unique amenities: personal swimming pools, private showers and balconies that overlook the Las Vegas Strip. It all conspires to bring customers to the middle of the desert during the dog days of August. And if you get tired of sipping expensive cocktails or ogling bronzed flesh, there's an open-air pavilion where you can play blackjack and craps. "Running a beach club is similar to running a nightclub," says the Beach Club's execuitve director of marketing, Jonathan Shecter, who, not coincidentally, comes directly from the nightclub business. After ticking off Lennox Lewis, the Kardashian sisters, Paris Hilton, and Leonardo DiCaprio as a few of his more well-known guests, he adds, "This creates a whole new day-part where thousands of people show up [during a traditionally slow time of year]." Shecter says the Beach Club has driven as many as 1,000 room bookings on a single weekend. "From a business perspective, having a beach club is one of the best things you can do." Indeed, it takes an activity that hotel guests used to enjoy for free -- hanging out at the pool -- and turns it into something that they feel compelled to pay for. While most hotel-casinos are maintaining their gratis pools for guests, in the shadow of the flamboyant pay-to-play pool parties, the free pools don't feel like much of a celebration. The Las Vegas Review Journal reports that 4,000 bottles of vodka and 2,000 bottles of champagne were ordered when Encore Beach Club opened its doors on Memorial Day Weekend. During a recent Sunday-afternoon visit to the Encore's guest pool in Vegas, things felt considerably tamped down. It was the dowdy equivalent of sipping Diet Pepsi in coach-class while you know that fine wine is flowing in the front of the plane. For a starting price of $40, however, you get an instant upgrade. David Schwartz, director of the Center for Gaming Research at University of Nevada, Las Vegas, points out that using pools to augment casinos is a venerable gambit. "Back in 1941, the El Rancho had its pool right in front of the casino," he says. "The idea was that people would drive into town from the dusty desert, see the pool, and realize that they need to stay there rather than going downtown where most of the gambling places were. Now, of course, it's about being able to sell more Red Bull and Grey Goose by dressing up the experience and making it cool."